We've already reviewed the seven figures that officially comprise X-Men Legends Series 4, so normally we'd now be reviewing the Apocalypse Build-A-Figure. Instead, surprise bonus figure! Forever racked with internal conflict and dark urges, Archangel nonetheless strives to be a hero, saving the world from grim forces of evil with the aid of his impressive metallic wings. 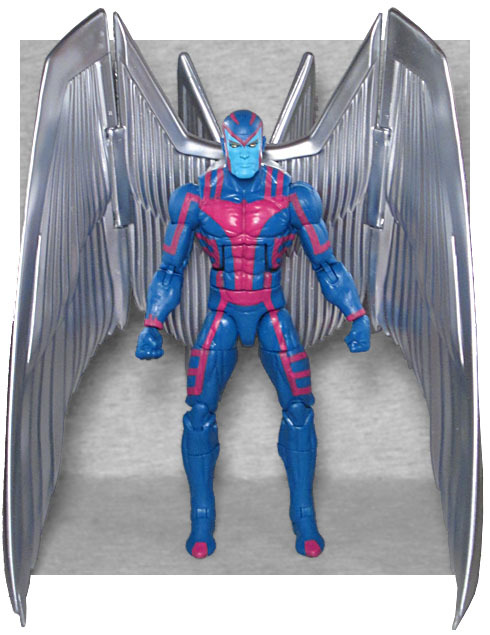 Hasbro put an Archangel in Marvel Legends 4, but since that series never made it to real stores and he didn't include a piece of Hit-Monkey, I didn't bother getting one. This isn't a re-release, although it does use the same body - everything on that figure was darker than it is here. Like, the "light" blue of that figure face is the same color as this toy's costume. This colorscheme is a much more like it is in the comics. And wouldn't you just love to know the reasoning behind Apocalypse outfitting his Horseman of Death in a blue and pink jazzercize unitard instead of something, y'know, threatening? 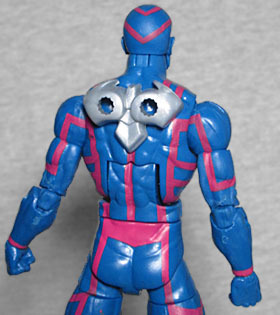 The entirety of this mold originated in the SDCC Uncanny X-Force set - which is to say, the body originated with Bucky Cap and has been used infinity times since then, but the head originated in the SDCC Uncanny X-Force set. The edge of the mask is sculpted on, clearly differentiating between his skin and his costume; despite the fact that his ears reside on the costume part of the map, they're still fully sculpted. That must be one tight suit! This set does include something the previous ones did not, and that's an outstanding array of alternate heads. None of them are new, but they don't need to be. They're all three of them impressively clever repaints. There's an unmasked head, showing Warren's blue skin and lengthy blonde hair. Where'd that come from? Adam Warlock, that's where! And the Magus head that originally came with that figure is here too, painted with dark circles around its golden eyes. Evil Warren! The final head is the Eel/Blizzard mold, painted with a gold face to represent the mask Apocalypse gave "Death" when he debuted against X-Factor. The mask has black circles around the eyes, and lines on the nose and mouth to make it look skeletal. I suppose technically it's meant to be metal, while this mold has wrinkles suggesting cloth, but for a repaint it works just fine. 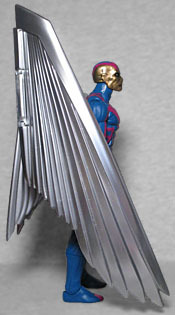 Archangel's wings are the same seen in the X-Force box set, with the same metallic silver sheen - when he was in ML4, they were just a flat gray. They rest in their own tray behind the figure, because they're just that huge. Even folded down, as they are, we're talking about a 10½" wingspan, and nearly 2" of extra depth added to the figure. They plug into his back, and are shaped to sit flush so they don't wiggle around. He can't spread the wings, per se, but they do get two points of articulation apiece: a swivel near the body, and a hinge in the middle. If Hasbro really wanted to impress us, they could have included a second backpack that just had the "hooks" that were left poking up above his shoulders when Warren would retract his new metallic wings. You can remove the wings from their mount, sort of creating that look, but it's not quite the same. The biggest surprise, though, has to be that Archangel includes a piece for the Apocalypse Build-A-Figure, despite not technically being part of the series that comes in. It's nothing vital, just an alternate hand to show off Poccy's techno-shapeshifting ability (which is a fancy way of saying "it's a big clampy claw"), but considering that what Hasbro was obligated to give this figure was "nothing," that's very cool. I kind of regret that you can't unlearn things, because I'd read '90s X-Men comics before going back to read the '80s "Fall of the Mutants" crossover where Archangel debuted, so I can never experience the shock of learning that Death was Angel all along. Like, as soon as this "mysterious" character shows up dressed like a clown at a gender-reveal party, modern readers can instantly recognize who he really is, so the pacing and rhythm of the story is completely shot. Still, none of that tarnishes the quality of this figure, which is easily the best Archangel Hasbro's made yet.